BioLite Base Camp – Turns Wood into Electricity! Okay, So I’m not the biggest camping fan, but I sure know of plenty of folks that love a little back-to-nature action, but I’m not sure that’s what this next gadget is all about. Sure, it would be awesome to have one on your next overnight trip off the grid, but it would be even more amazing should you find yourself without power, or stranded in an area without modern conveniences, heck… it could even save a life. Check out the BioLite Base Camp, made by the same folks that brought you the smaller Biolite Camping stove, the wood-fired energy source for individuals. The New Base Camp is another self contained cooking and energy solution, this time, the right size for your whole family. 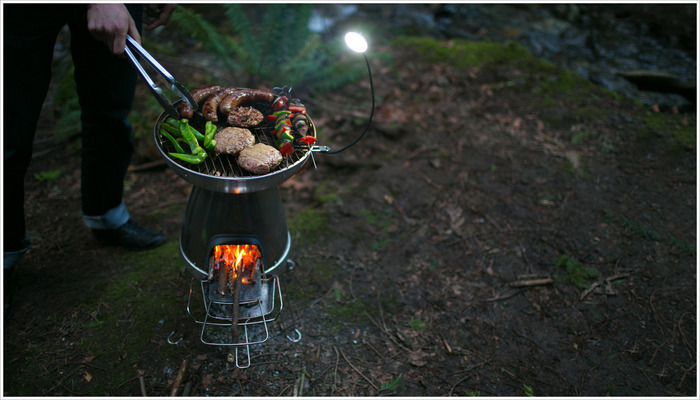 Using only fallen branches or small pieces of kindling, you can make a wood-fired meal AND charge your devices all at the same time. It’s a great alternative cooking method that burns smarter, and cooks better, than any campfire you’ve ever had, and did I mention it can charge your phone? So, you can get out in the wilderness, have all the flavor and fun of a wood fire, with no smoke. Grill, or boil whatever you need to feed your family, keep a light on, and keep your electronics at the ready. Wood into electricity?… now that’s cool. Everything you need for a real base camp. So whether you’re backpacking, camping, dealing with storms and power outages, or simply preparing for the coming zombie apocalypse, The BioLite Base Camp could be just the kind of gear you are looking for. Check out the already funded Kickstarter campaign, where you can nab one for around 300 bucks, shipping this Fall.